So why do most people think math is just for geniuses -- that they could never get good at it? The reason students find math so hard to learn is that it demands discipline and vigilance at all times. Math has order and grammar rules like any language. The beauty of math language however, is that there are absolutely no exceptions to the rules. Unlike French or English, which include lists of exceptions, once you learn the parts of speech, order, and syntax of math language, you've got it covered. For example, in English, you could say: "Your boots -- put them on! ", and though the order of the words is not quite right, you'd still be understood. In math however, this is not so. We don't write zyx -- we write xyz. which says "There exists an x, that is a real number, such that the absolute value of one less than x is greater than 4." Actually, the image above depicts the logical conclusion of the sentence rather than the sentence itself. 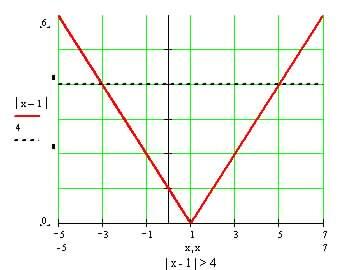 The dashed, black, horizontal line is at 4 on the y-axis, and since our statement says that the absolute value of x  1 is greater than 4 we want to concentrate on the part of the red curve that is above this line. As you can see, the x-values found left of  3 and right of 5, generate the points on the red curve above the black line. Now we're looking at math TV -- there's audio in the algebra and video in the graph -- so, as with all languages, once you learn to speak math, you will be able to picture the images provoked by the "words".